Looking for a Baltimore travel guide? Baltimore has come a long way. The capitol of Maryland used to be more renowned for its high crime rate than for its tourist offerings. But after years of cleaning up its image, this trendy city now boasts a wide range of activities to please all ages. It’s also become a popular embarkation port for an economical cruise, as I recently learned when we went on a seven-day cruise to the Bahamas from Baltimore. Although I booked our cruise directly through Carnival, you can often get last minute cruise deals through sites like www.vacationstogo.com and www.bestpricecruises.com. We went to Baltimore a day before our cruise to check out the sights and centered our activities near the Inner Harbor. Baltimore’s National Aquarium, once considered the top aquarium in America, has lost some of its luster thanks to stiff competition from Atlanta’s Georgia Aquarium and the Virginia Aquarium in Virginia Beach. And it’s not cheap: Basic tickets (no IMAX or dolphin feedings) are now nearly $130 for three adults and one youth. An amazing jellyfish at the Baltimore Aquarium. 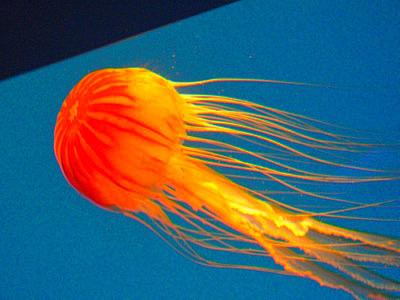 If you do go, don’t miss their breathtaking exhibit, “Jellies Invasion: Oceans out of Balance” which features luminous jellyfish ranging in size from a dime to a dinner plate. It’s hard to believe these amazing creatures have no brain, with the exception of the muffin-sized Upside-Down Jelly, which seems stuck in reverse at the bottom of the tank and clearly seems to be a few cards short of a full deck. 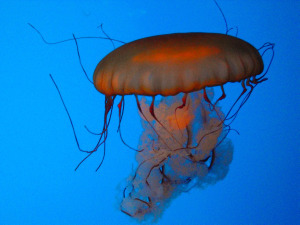 It's hard to believe these amazing creatures at Baltimore Aquarium have no brain! Other Baltimore travel attractions within a short walk from the Aquarium include the Port Discovery Children's Museum, the Maryland Science Center, the Sports Legends Museum, and of course, Camden Yards, home of the Baltimore Orioles. Visit Fort McHenry, which inspired the writing of the "Star Spangled Banner." But since I love travel deals, our two favorite sights for Baltimore travel were free or inexpensive. The first is Fort McHenry. It was here, during the War of 1812, that Francis Scott Key was inspired to write “The Star Spangled Banner” after the fort held out against a British bombardment. The Visitor’s Center features a stirring 15-minute film about the battle. As the film ends, the curtain opens and--to the strains of “The Star Spangled Banner”--you get your first view of the Stars and Stripes flying over the fort. It’s a very emotional moment that makes you proud to be an American. 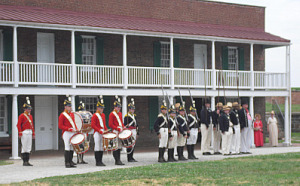 The fort itself houses barracks containing displays on how the fort was used during the war of 1812, the Civil War, and even World War II. On weekend mornings during the summer you can see costumed re-enactors perform military drills and fife and drum concerts. A must for the kids? The free Junior Ranger program. It offers a workbook full of puzzles, mazes, and scavenger hunt activities designed to teach kids about the fort while having fun. Kids who successfully complete the workbook get a Junior Ranger badge and official park pencil. Entrance to Fort McHenry is $7 for adults. Kids 15 and younger are free. 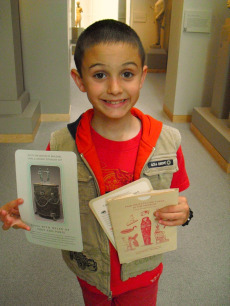 Even kids love the Walters, thanks to free scavenger hunt cards. While the Baltimore Museum of Art is widely known for its excellent collection, we prefer the more family-friendly Walters Museum. It’s a short cab ride ($8-$9) from the Aquarium, and it’s free. 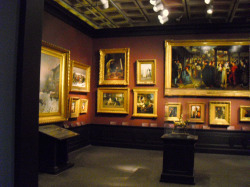 They have a packed-to-the-gills collection of ancient Roman, Greek, Egyptian, Renaissance, and European art. Plus, in what’s undoubtedly the best program for kids I have ever seen in an art museum, they offer special carts on weekends where kids can borrow art books, pick up free art scavenger hunt cards…even borrow a quilt with pockets full of things to read, touch, and hunt for. In addition to a little cafe for a snack in between roaming from room to room of fantastic art, the Walters Museum also has a lovely gift shop which really unique items. I bought a beautiful, unusual Art Deco necklace there which is still one of my favorites! For details, go to www.thewalters.org. Looking for more than just Baltimore travel info? For all the amazing attractions to see in nearby Virginia, go to our Virginia Attractions page. 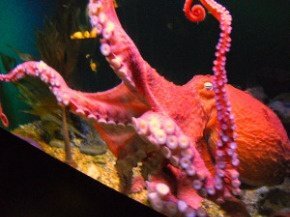 The Baltimore Aquarium even has a sleepy octopus. If your Baltimore travel vacation involves spending the night, the Holiday Inn Baltimore Inner Harbor-Downtown is a ten-minute walk from the National Aquarium and major shopping. As at all Holiday Inns, kids under 18 stay and eat free with a paying adult. Rooms range from $140-$200 for two doubles, while secure parking at the hotel is $20+ per day. In addition to a full service restaurant, they have a snack shop in the lobby which sells breakfast sandwiches, pastries, coffee, and drinks. If you visit Baltimore for the day, parking is available in a number of lots near the Aquarium. Only four blocks from the Aquarium, the Harborplace 55 Market parking lot offers a flat rate of $14-$15 per day on weekends. If you’re willing to walk a bit further, you can find parking for as little as $9 per day on weekends. If you love good Italian food, be sure to check out the restaurants in Little Italy, a short cab ride from the Aquarium. Top-rated Aldo's Ristorante Italiano is a long-time Baltimore favorite known for impeccably top-notch ingredients. For died-in-the-wool Italian food gourmands, it’s worth the steep bill (@$130 for two for dinner). If your Baltimore travel stay is to take a cruise from their efficient Cruise Maryland port, here's what to expect. Long-term parking at the cruise port is $15 per day. Or, if you stay at the Holiday Inn Express Inner Harbor you can get a stay-cruise rate that includes free parking during your cruise and a free shuttle to the cruise dock. For more about cruises from Baltimore or Norfolk, Virginia, go to our Cruise page.